Twitter, the microblogging application that allows you to post something about your everyday experience in 140 characters or less, is gaining ground as the newest way to connect and interact with other net denizens. Your tweets (posts) can be as mundane or as elaborate as you want to make them. You can also include links, which are automatically shortened by TinyURL to give you space to fit more text. Spaces and characters count so making the most (or less) of the 140 character limit is an oddly neat way to make your thoughts as succinct (hopefully) as possible. It’s easy! You create an account here, upload a picture/graphic, and write something. That’s it. There are many ways to connect, enhance, and facilitate your use of Twitter using dozens of Twitter applications. You can post from the Twitter website but you can also update from your status bar with TwitterFox (my favorite) a Firefox extension, from your mobile phone, or your desktop. A growing number of corporate entities can be found in Twitter: NPR, PBS, both democratic candidates and browsers too, like Flock and Firefox. You can follow individuals/entities based on same interests, profession (librarians, anyone? ), location, or simply because their tweets are so dang interesting. 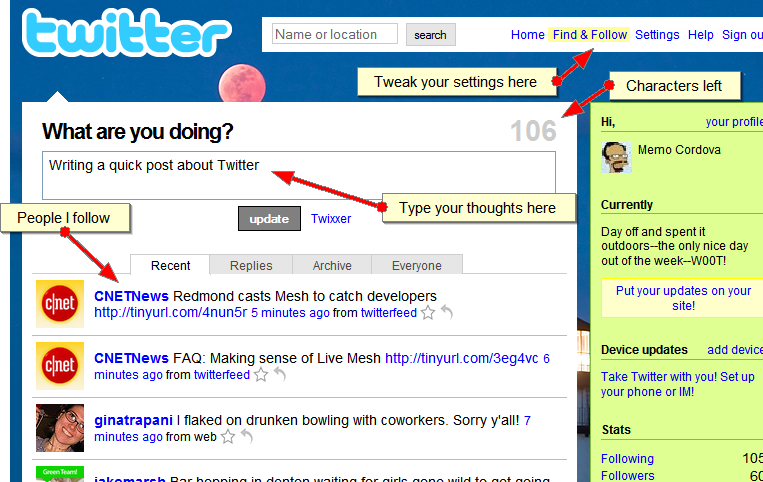 Use Twitter as a heads up on new technologies, teaching tools, or web services. Websites like TechCrunch, Lifehacker, and Mashable (they all Twitter) allow you to keep up to date on new technologies and development. Find out what people are Twittering about, what topics are being discussed, based on specific keywords. I find Twitter a cross between e-mail and chat, a quick and easy way to communicate that is not so in-your-face like chat, but not so removed from the asynchronous nature of e-mail. Even though you can message specific individuals (you use the "@" symbol with the person’s profile name) you can have synchronous conversations if other individuals happen to be online at the same time–i.e., they respond to your tweets fairly quickly. Twitter may not be for you, but I’m finding it a lot more engaging and informative than other social services. If you want to experiment in Twitter by all means follow me and I’ll return the favor–we can try it out together!